Temporary workers are often some of the most valuable members in an organization. They can provide much needed help during peak output periods and ensure that you meet all deadlines and obligations. 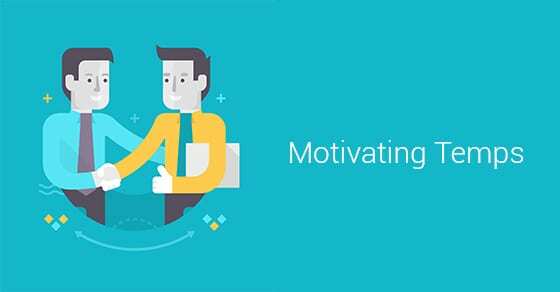 Like all employees, contingent workers must also be motivated. This is as much your responsibility as it is theirs, so you need to understand how to motivate temps for the greatest return. The first step in motivating your temps is to show them that they are equally valuable members of the team. Give them proper job titles that don’t indicate their temporary status. You can present temp workers to the other employees in relation to the tasks they’ll be responsible for. Provide names and contact information in case anyone has a question. This makes temporary employees feel more welcome and essential to the entire business. You can also make them more familiar with the business by providing a guided tour to show them all aspects of the business. If they learn the primary goals of the company, temp workers can align themselves and have a shared objective in mind. Temps need proper support to effectively transition into the workflow, so you should give each individual temporary worker responsibilities that most closely match their skill sets. New projects will require guidance. Be sure to offer help to temp workers. They will likely have many questions in the early stages of your work together. They are an equal component in getting the business results you’re after. They’re work and roles in the business should be recognized, respected and supported by everyone. Many companies now are offering online training for their on-boarding initiatives so new workers are fully aware of their job duties and quality of work expected from them. Every task will require a specific set of tools and materials. Be sure to have everything provided as soon as they begin to work. Plan ahead and prepare the workspace so that they can get started without any friction. Temp workers should also understand the environment they are working in. Every company has a unique culture from which it operates. Let your temp workers become familiar with this aspect of your business, as it will provide more information on what is expected by everyone. Some of the best permanent employees start out as temporary. Show respect to your temp workers so that they’ll want to return if you should decide to hire them on a permanent basis. Working with temps lets you find highly skilled workers as you work with different individuals. This is a great resource for the future growth of your business. Treat temp workers as you would with permanent employees. Provide the proper support to ensure maximum productivity and satisfaction for your temps. This can start new relationships that benefit your company in the long run.